After a good night sleep, we woke up again at early morning on the 3rd day. We bought croissants, baguette, and other breads at nearby boulangerie called Maison Privat. Surprisingly, the plain croissant was super good! The outside is flaky while the inside is chewy and the taste is super buttery… It just melted in my mouth! We brought a lot of breads since we were going to Chateau Versailles later. We thought we could do some picnic at the garden as many people said in the blogs. posts. I think this is the most ornate bridge that I’d seen in Paris. 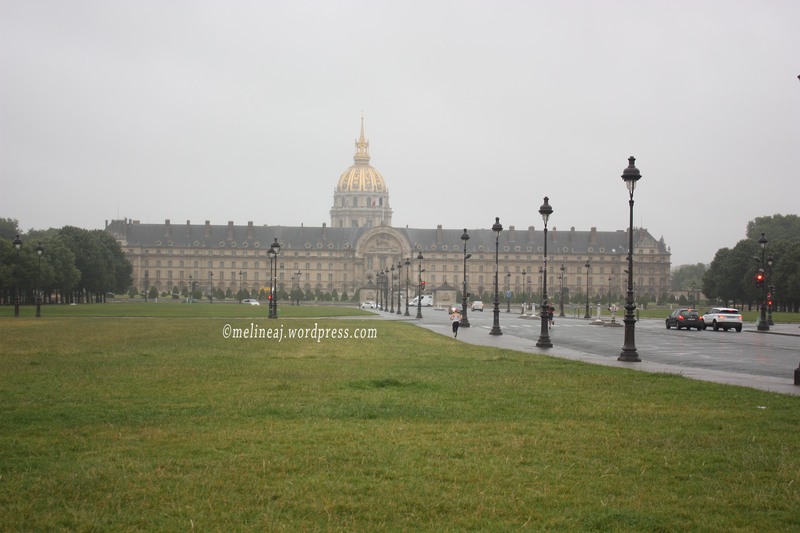 We then went to Invalides metro station to take RER line C to go to Versailles Rive Gauche (Chateau de Versailles). NOTE: there’s another train going to Versailles Chantiers and this is NOT where Chateau de Versailles is!!! Since we already had Zone 1-5 Paris Visite Pass, we didn’t have to buy extra ticket. While we were on the platform, we were confused since the signage and the monitor showed different trains. At first, I thought the train would stop at the left platform #2 – since the coloured monitor told us so – but then when the train was about to arrived, a train conductor told us to move to the right platform #4 if we want to go to Chateau de Versailles. I took a peek at the other monitor (the blue non-coloured one) and the train at the right platform was the correct one. So, follow the blue monitor (see the picture) to find your platform and the right train! It took about 30 minutes to reach Versailles and expect a lot of tourists there! When you get out from the train station, don’t be fooled by the people giving you brochures for Chateau Versailles tour ticket. This is NOT the official ticket and it is more expensive! These people directed you to go to a small shop across the street to buy the tour ticket. Fortunately, we read the brochure carefully and ignored them. The official ticket booth is near the entrance of Chateau Versailles, so again, don’t be fooled by the unofficial tourist agent. To go to the Palace from the train station, you have to cross the street and walk along Av. de l’Europe until you reach intersection of Av de Paris. Turn left on this small street and you’ll see the golden gate of the Palace from afar. The ticket booth is inside a small building on the left of the security check/ entrance of the Palace. There was a long line up inside when we were there. Halfway along the line up, there was an information booth where we grabbed a map of Versailles. Feeling bored, I walked around and saw a sign showing Ticket Vending Machine is available. Learning from our experience at Louvre, I told my hubby to stay in the line while I walked to find the room where the vending machines were. The machines were a bit hidden at the back room near the washroom but then it was totally empty! Nobody seemed to notice these machines and when I checked, the ticket prices were the same as I researched on the internet. So, I called my hubby and we decided to buy from the machine. Ticket for Palace only is €15, but we bought the ones with Palace, Garden, and Marie Antoinette’s Estate access (also known as Passport) for €25. Should you buy the Passport? I suggest, you should consider how much time do you want to spend here. Since we already planned to spend whole day here and I really wanted to see Marie Antoinette’s Estate, we bought the Passport. But, if you just want to see the Palace and move on to the next attraction, buy the Palace only! May I remind you that the Palace itself is MASSIVE! 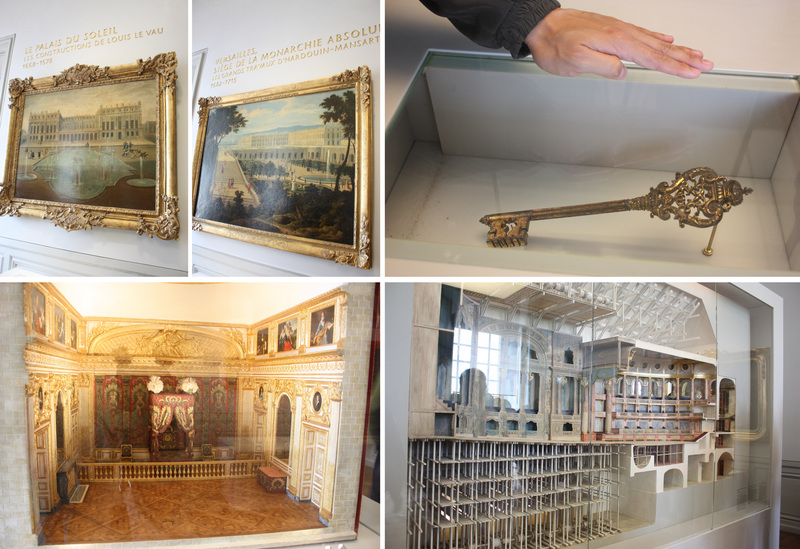 For touring inside the Palace, we spent about 3 good hours (well… plus picture taking time). Wear your most comfortable shoes when you visit here! At the security check at the entrance of the Palace, they posted a sign with lots of items that they don’t allow inside the Palace. One of them is LONG umbrella! When we were lining up, the rain started to drizzle. Luckily, we brought folded umbrellas to cover ourselves. However, I saw lots of people brought long umbrella and since they will ask you to leave this at the security check, you have nothing to cover yourselves when it rains at the garden or during your walk to the Estate. So, the best thing is to bring a folded umbrella in your bag. Another thing was to place any food or beverage that you bring INSIDE your bag. Yes, they scan the bag, but the chance they confiscate your food is minimal. Why do I suggest putting the food inside your bag? It’s because it happened to us! My hubby held a McD paper bag during the check and immediately, the security people asked him to leave the food there. It was a bummer since we purposely brought sandwich to avoid the expensive tourist food inside. In addition, one of my friends told me that she had a picnic at Versailles, so it was kinda a bummer. I saw lots of other people had their food at the garden, so yeah they must have put the food out of sight from the security people. Okay… This one I noticed it but I kinda ignored it. When we left the garden and walked toward the Estate, we passed the gate with a sign “Access to the garden closes at 5.30 pm.” They also warned you on the map of the Versailles. I thought this access was the garden access from the Palace to the Estate – not vice versa, but in fact, this is valid for BOTH directions: from the Palace and from the Estate! 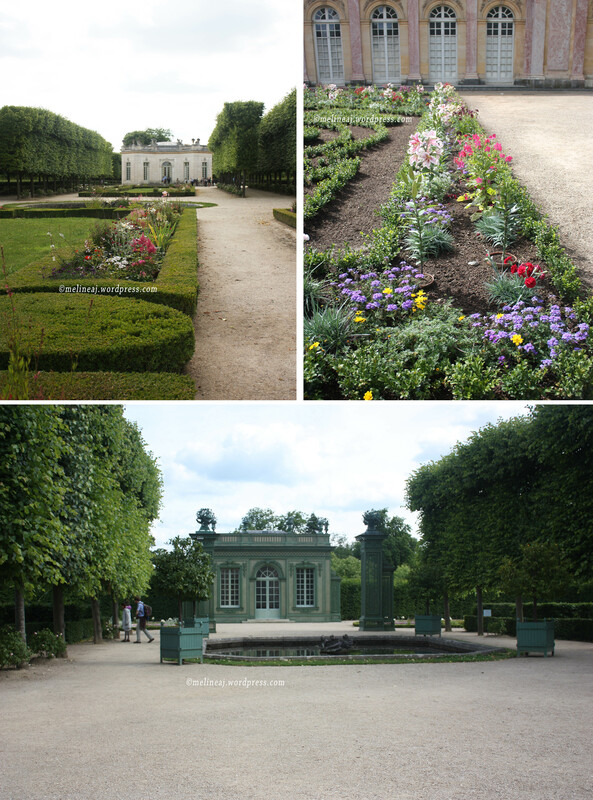 After walking around the Estate, Grand Trianon & Petit Trianon, we lost track of time. We walked back to the gate toward the main Palace just to find that it already closed! I was furious! Having walk almost 1 kilometer with tendonitis on my right ankle, I started to curse as we walk the detour path. We had to walk back to the front of Grand Trianon and walked along Av. de Trianon to exit via Queen’s Gate. My hubby suggested that we just let go our confiscated food but I was angry and insisted to go back to the main entrance and retrieved our food. If this happened to you and you have no more power to walk, you can catch a Phébus in front of Grand Trianon gate (at the very end of Av de Trianon). However, the bus only comes once every hour. Okay… Let’s not be cranky…. Let’s start my exploration of Chateau Versailles. After buying the ticket from the vending machine, we felt very good that we skipped halfway of the line. (See… my excitement level went from super high to super hell low at the end of the day hahahah….). In order to enter the Palace, we had to go through the security check and the line up was pretty long (about 30-40 minutes). While lining up, we took pictures of the golden gate of the Palace. My hubby said that he loved the gold colour and suggested to paint our house in gold so people can notice our house easily hahaha…. As I mentioned earlier, during the check, they confiscated our food (my grumpiness level= 1). Before the tour, I suggested that you visit the washroom since it was kinda hard to find one during the tour. At the beginning of the tour, you can borrow an audio guide for free. We borrowed two but I didn’t really use it much since I was busy taking pictures. Going to the second floor, you can feel the grandness of the Palace. Everything is made from marble! 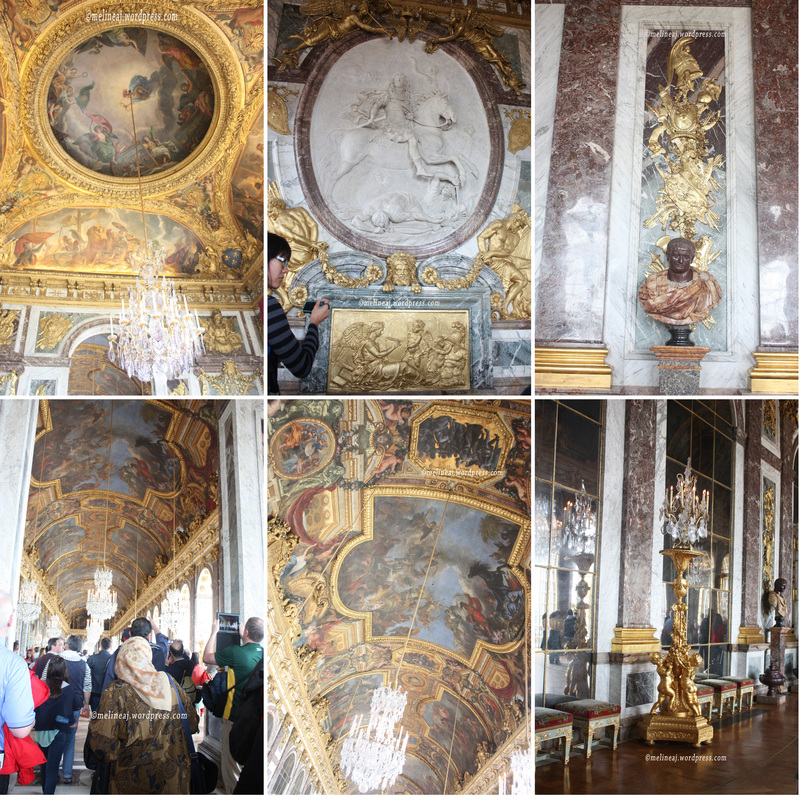 To start the tour, we walked toward different small rooms showing the development of Chateau Versailles from time to time. We then walked toward the Palace chapel that is still functioning. Next was the Grand Appartement du Roi. 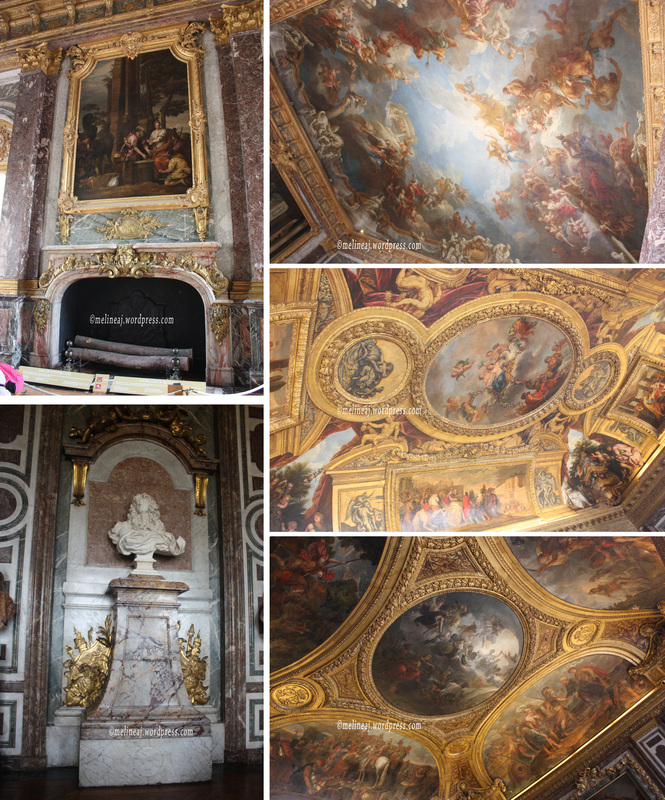 There was a room with full marble from ceiling to floor (Salon de Diane). The stand for the busts, the wall, and the fireplace were made from marble. Exquisite! Don’t forget to look up to the incredible ceiling that was painted in every room. 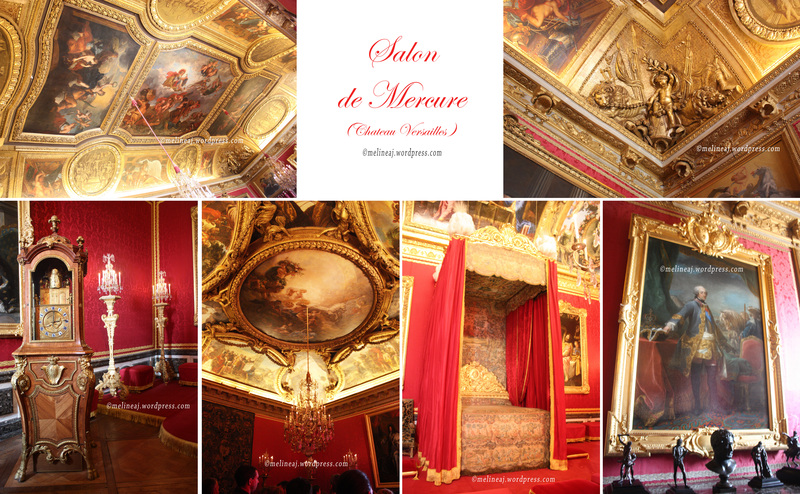 Next was Salon de Mercure. The combination of red and gold colour really reflected the greatness of a king. Amazing! The next thing we saw was the Hall of Mirrors. The hall is just simply breathtaking! Behind this hall, there were King and Queen’s bedroom. 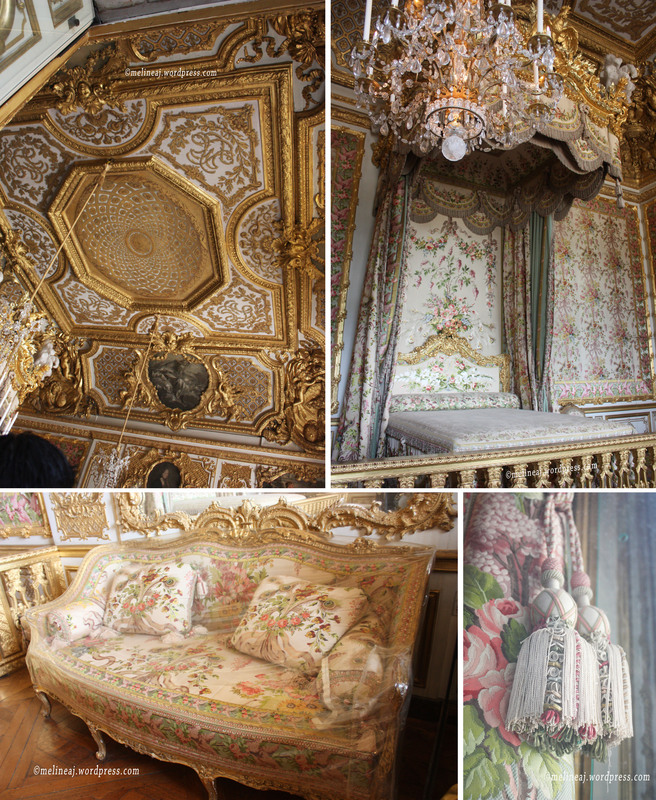 One thing I can say about the King’s bedroom is STUNNING!!! The queen apartment was also very elegant and pretty! The flowery pattern with subtle turquoise colour matched beautifully. Oh… don’t forget about the tassel! Every little details seemed to be planned carefully with a lot of taste! 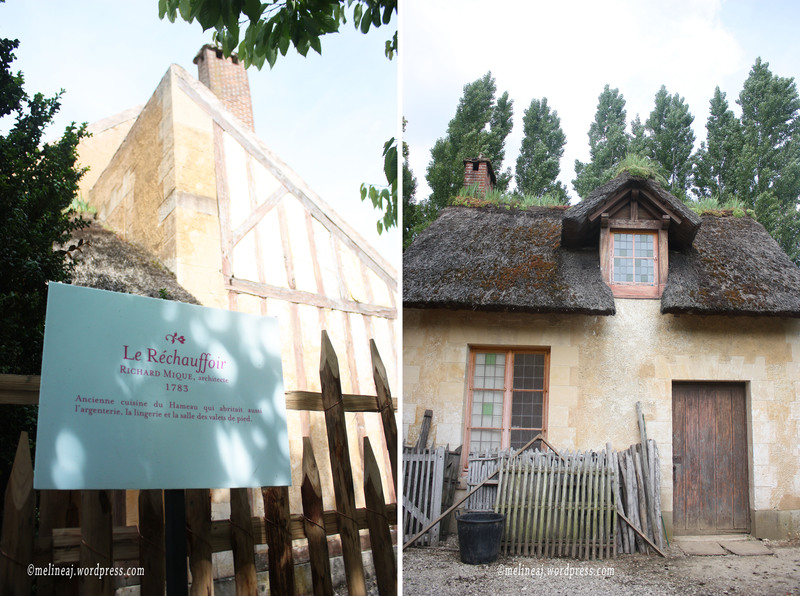 I really envy Marie Antoinette hahahaa…. The rest of the tour was kinda blahhh… NO! hahaha… I was just kidding. Every corner we saw, we were amazed by it! The battle gallery stored the different paintings of the general and kings during each period (it’s like photograph of important people during those era). 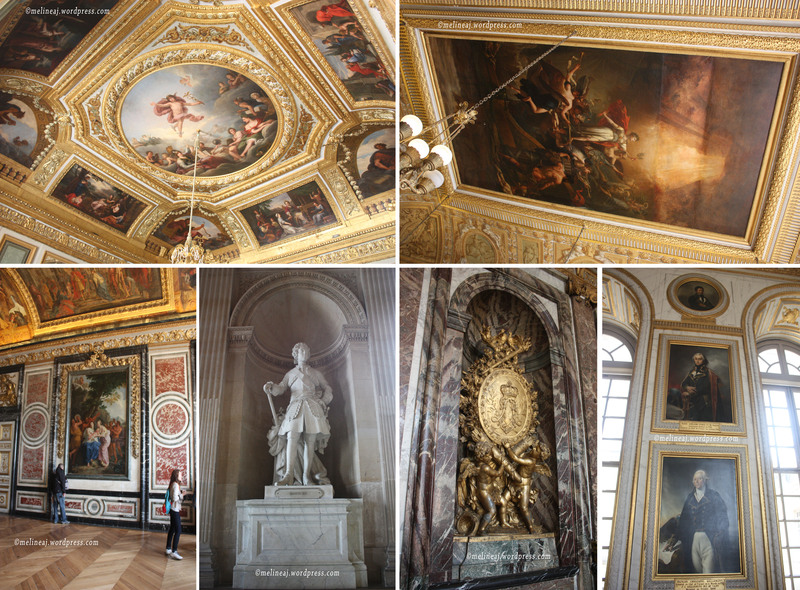 Not to mention, the grandness of “The Coronation of Napoleon” painting (yes… this is the replica of the one in Louvre). We couldn’t stop to look up to the ceiling, down to the amazing decorated marble floor, and around. Okay… we spun our head around in awe! The stroll inside the garden was nice since it wasn’t too hot and the green feeling around us make the walk enjoyable. When we arrived at the very end of the diagonal path proposed by my hubby, we found out that the path was closed with fence! So we had to walk back toward the main path (my grumpiness level 1.5). When we finally reached the gate exiting the garden, we saw a lot of people crowded this area. It seemed like this was the popular area to have picnic. There were also bike and pedal boat rental to explore this side of the garden. The boat rental – there was a wedding ceremony! Here was where me and my hubby started arguing. My right ankle was starting to hurt again and I started to blame my hubby not taking the mini-train (my grumpiness level= 5). We stopped for many times since my ankle was really really hurting me. 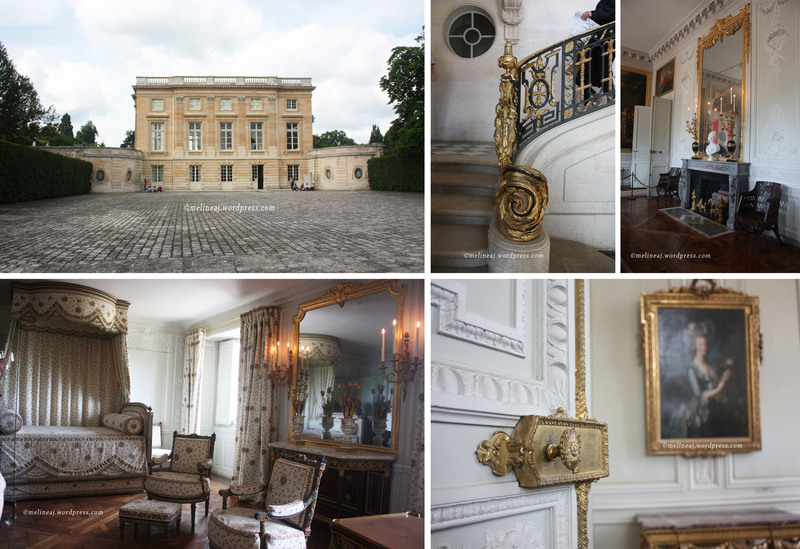 At the end, we finally arrived at Petit Trianon. We looked inside for a bit and my hubby wasn’t too impressed since this was a smaller building and the decoration inside wasn’t as grand as the palace. For me, the details inside this smaller house were incredible. Even the gardening tools were decorated! 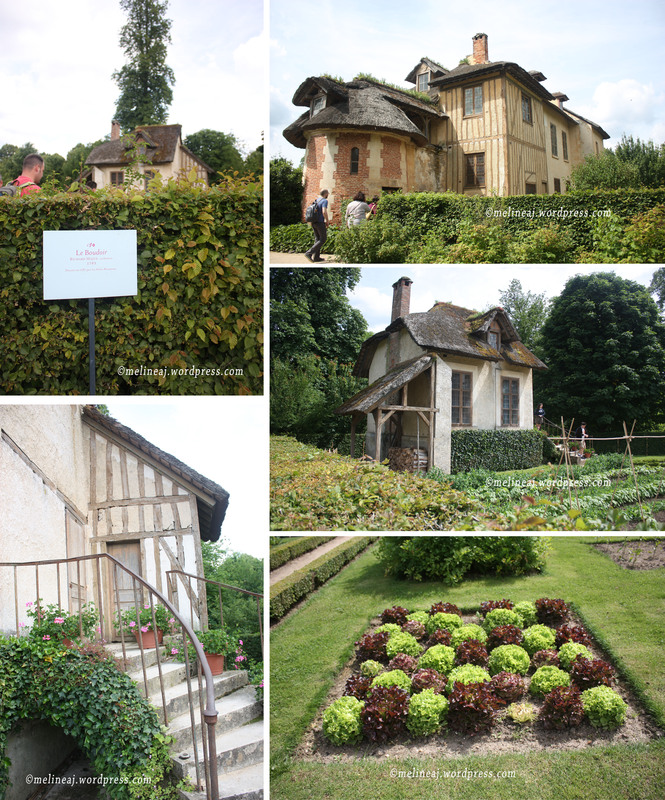 We then headed to the Marie Antoinette’s Garden since I really want to see the unique small houses as I saw on the TV show. The access to the Garden was at the back of the Petit Trianon. The little courtyard at the back looked so dry and messy but the rose bushes made it feel so welcoming (and it smells really good!). They have a map showing where the Garden was but it was really hard to find since the path was very narrow and small. Good thing that I took picture of the map so we could refer back to it when we were lost. The path to the Garden was dusty among the high grasses. I think they left it in the natural state as it used to be. The pond, the small brick bridges, and the sound of trickling water from the small stream were very calming. Since we spent a lot of time here, we skipped the farm nearby (yeah… my hubby was getting cranky and bored). 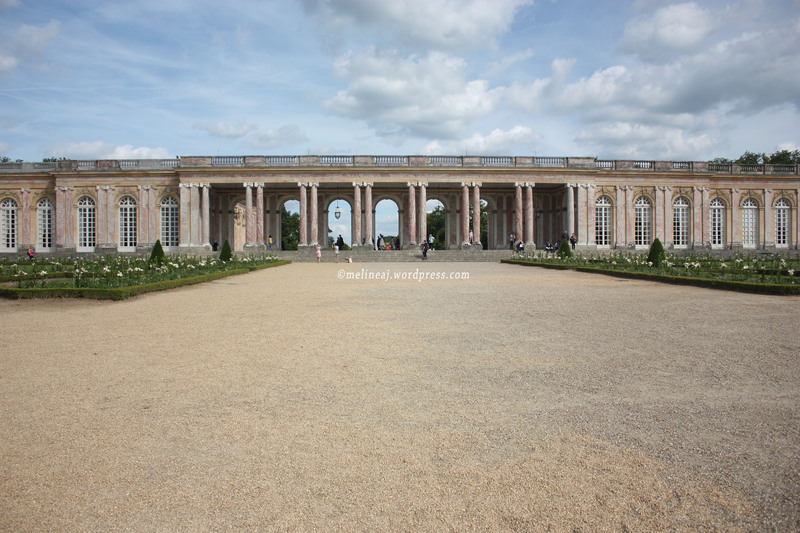 We walked back toward Petit Trianon and continued our exploration to the Grand Trianon. Here, there were right and left wing at the Grand Trianon. 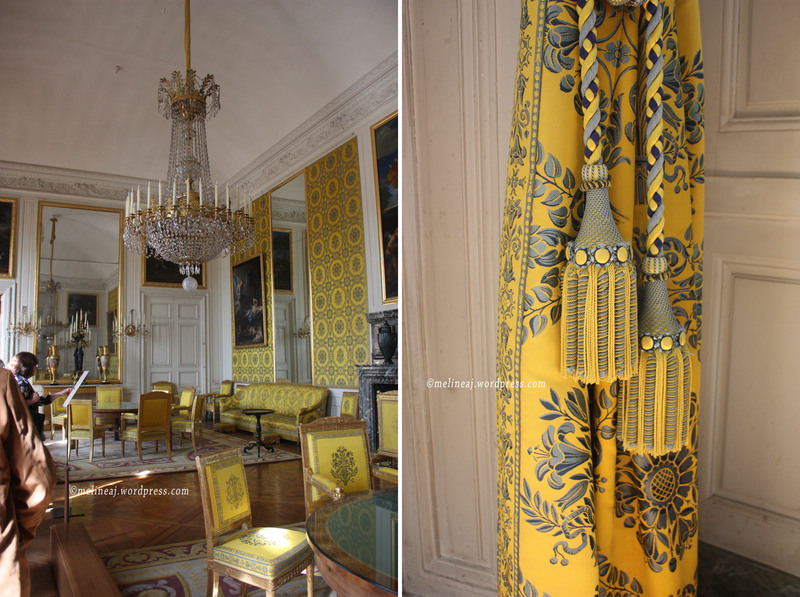 There were yellow room and pink room that I really adore. After finishing our tour at the Estate, we want to catch the mini-train. Unfortunately, it was 6.30pm and the last train already left. We walked back to the gate where we exited the garden earlier and we both not realized that the access was closed at 5.30pm! When we were at the gate, I was ready to explode! (Grumpiness level = 100!!!). Anyway, it was our fault not remembering this crucial time! We walked back toward the front of Grand Trianon and exited via Queen’s Gate. Apparently, this gate was at the east side of the Chateau Versailles complex. As soon as we exited the gate, we were outside the complex and there were lots of restaurant and souvenir shops around. 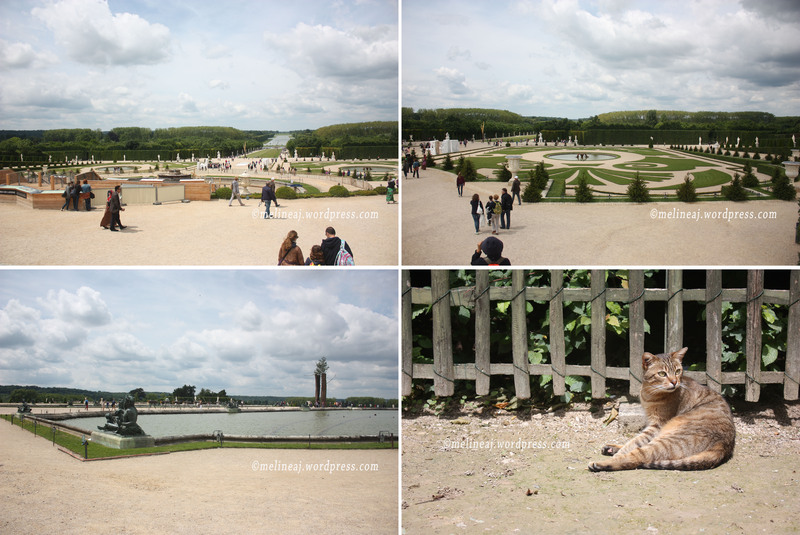 I wished we didn’t waste our time walking around the complex so that we could explore Versailles a bit more. When we arrived at the entrance, I sat on the chair near the golden gate and ignorantly put my feet up. I didn’t care who looked at me… I just felt my ankle was hot and swollen! After from retrieving our sandwich, we ate the sandwich there like two hungry bum hahaha…. 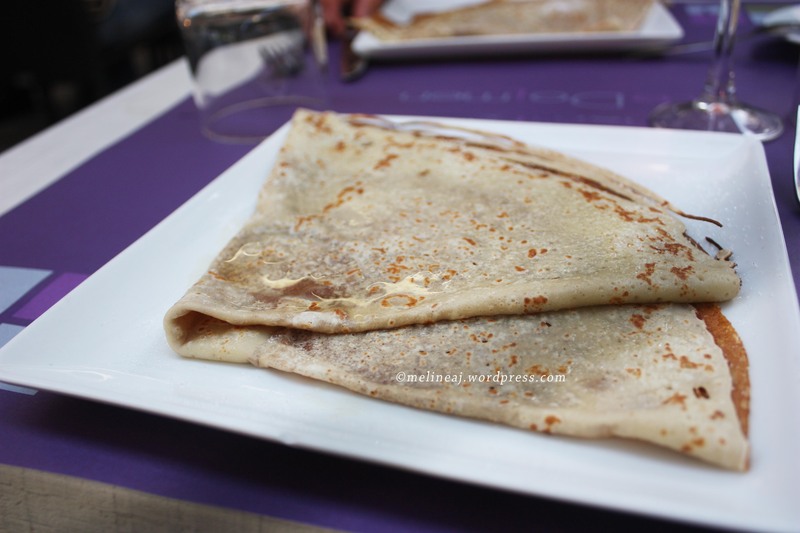 On the way back to the train station, we stopped at Le Dolmen restaurant to have crepe (this was my hubby’s way to keep me happy – yes… supply me with sugar hahaha). My hubby had plain sugar crepe while I ordered Calvados flambé crepe (they poured liquor on top of the crepe and lit it up with fire). The crepes were just ok but the thing that amazed me was the price of water that was €4 VS the price of a glass of rose wine that was €2.5! Clear choice, rose wine won for me! We went straight back to the apartment after a long day at Chateau Versailles. We rest for two hours and my hubby had a chance to take a nap. When he woke up, it was 9 pm but the sky was still bright like in the afternoon! Even though I was tired too, I forced my hubby to accompany me to Eiffel Tower. It was our last night in Paris anyway so I want to max out our time as much as we could! This time, we took metro to go to Eiffel Tower which took longer in my opinion. From Bir-Hakeim metro, we walked along Quai Branly and we saw the lit up Eiffel Tower from afar! We stopped to took picture and a couple was kind enough to take our picture. We walked until we were under the tower. For some reasons, my eyes were drawn to see the North gate. I saw people lining up to go up and then I saw the sign that we could still go up to the 2nd floor of the Eiffel Tower (the ticket was €8.5). Thus, I dragged my hubby. The line up was not bad at at. We waited for 10-15 minutes to buy the ticket and directly went up to the 2nd floor using the elevator. Not long after we were at the top, the lights on the tower blinked for a couple minutes. We took pictures of the city from the top. Oh don’t forget to kiss when you’re on top of Eiffel Tower. Ah… it was magical! It was the perfect way to end our visit in Paris! 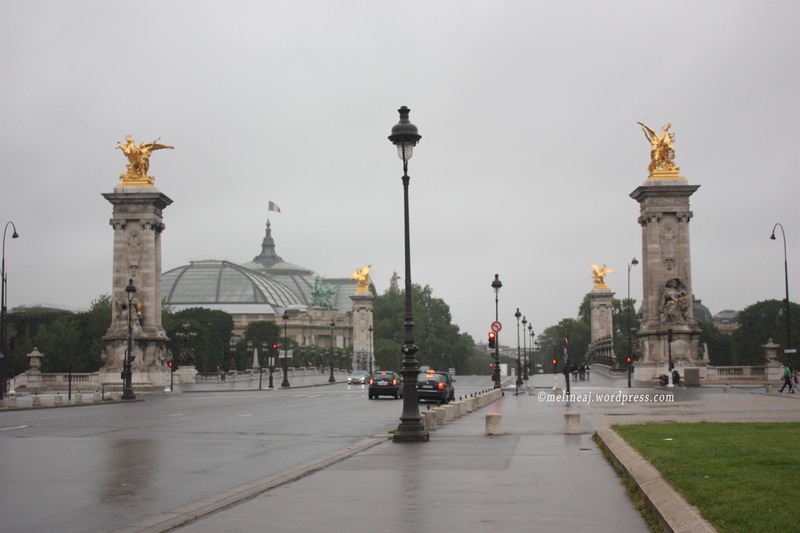 2 Responses to "Paris Day 3 (Pont Alexandre III – Chateau Versailles – Eiffel Tower at night)"
I will visit Versailles too and thanks to you now I know we can do picnic there. Yaiy! Yup. European art and history are just simply elegant, esp. the architecture!